The Vivosport is the true fitness tracker successor to the Vivosmart HR+, our 2016 Fitness Tracker of the Year. We say true because for some time we thought that was the Vivosmart 3 when it arrived on the scene earlier this year, leaving us wondering if Garmin was done with its GPS-packing wearable. But we'd needn't have worried because it's back and filled with all of the Vivosmart HR+ goodies we loved, along with some new extras and a bit of a design makeover. At £169.99, it's competing with the likes of the Fitbit Charge 2 and the Polar A370 – albeit it has one key feature that those two don't, and that's the ability to track runs, rides and walks without having your phone nearby. 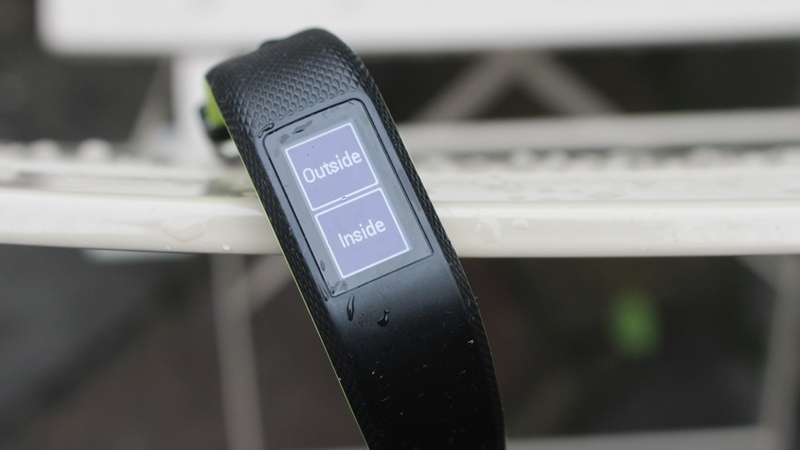 It's also a bit cheaper than the Vivosmart HR+ when it first launched. So it has a pretty tough act to follow, but it has all the ingredients of being one of the best fitness trackers to own if you value proper sports tracking as much as you do being able to monitor your sleep and counting steps. We've been putting the Vivosport through its paces the past few weeks to find out if Garmin has delivered the goods again. Read on for our full verdict. If you've been following the evolution of Garmin's fitness trackers (and we're sure you all have been) then you might recall the first couple of Vivo iterations were not the prettiest. Things improved on the design front with the Vivosmart HR+, but it was still every bit a device built to Garmin's tried and tested sporty design blueprint. With the Vivosport, you can expect something that looks-wise sits somewhere in between the Vivosmart HR+ it's replaced and the Vivosmart 3. It's still sporty, and apart from a choice of different colour finishes on the underside of the band, it's not going to grab too many style points. You've now got a more textured, rugged strap, but crucially less screen estate to interact with. The 9.7mm x 19.3mm display is notably smaller than its predecessor and the black bezel surrounding it doesn't help matters. It seems like an odd decision, especially when Garmin went bigger on the Vivosmart 3, and it seems even more odd when you realise that there's no longer a physical button below that touchscreen display. Yes, it's all about touchscreen navigation, which quite frankly feels very fiddly with so many features and modes to scroll through and get acquainted with. You can perform swipes, taps and hard screen presses to select items but it can at times be a fiddly process on a screen this small. Wearing it day to day, you're able to take it in the shower, or even for a swim, thanks to the 5ATM certified waterproofing that protects it up to 50 metres deep. It still comes in small and large models, but both essentially will accommodate the same amount of space on your wrist. It's slim, not too thick and by no means a bulky thing to wear. Going back to the screen, the resolution isn't really anything to shout about but that's something we're getting used to with Garmin. It's a pretty paltry 72 x 144 pixels, which is not the punchiest of displays, but with the right screen brightness visibility is perfectly fine during the day and for those nighttime workouts. We should mention it's an always-on display, which has its benefits from a timekeeping point of view. But it's also very sensitive, so when you're in bed and you move around it has a habit of lighting up, which quickly becomes a nuisance. You can turn on a screen lock to prevent it from accidentally starting to log a run, but it won't stop that screen illuminating. This is the bread and butter of the Vivo wearables. Delivering fitness tracker features for those people that don't hammer out big runs at the weekend but want something that will motivate them to stay active. What you get on the Vivosport is a lot of what we've seen before. It'll count steps, monitor sleep and display resting heart rate as well as estimate calories burned, track elevation, measure distance travelled and record intensity minutes. What's nice with the way this data is displayed on the Vivosport is that a simple tap will show you your previous day's data. So you can quickly establish whether you've slacked off or actually climbed more steps. Staple Garmin features like automatically adapting daily step count goals and its Move Bar both make the cut as well, offering subtle but effective ways of making sure you're not only moving, but moving more. It also inherits the stress tracking features from the Vivosmart 3, a feature we were initially sceptical of, but which actually works well. Once you've swiped to the dedicated screen, it'll display your real-time stress score based on heart rate variability data. When it notices that score is particularly high, it'll prompt you to perform some guided breathing exercises. While it only appeared a couple of times in our testing, it's a nice example of Garmin's wearable's ability to react to biometric changes. As far as accuracy is concerned, we are once again relying on pretty standard motion sensors and Garmin's own algorithms to deliver the goods. Up against the Apple Watch Series 3 and the Forerunner 935, there was usually a 200-300 step count difference between the readings, which in our book is a pretty decent showing. When it comes to sleep it fared pretty well with the Withings Aura sleep monitor, offering a simple breakdown of deep and light sleep as well as time spent awake. When it comes to making sense of that data, you'll need to hunt out Insights, which is tucked away inside the Garmin Connect app. It's here that Garmin will compare your data against other users and tell you how you fare for step counts and sleep. It'll also notice if you sleep or step more on certain days, which is the first sign of Garmin attempting to offer some actionable insights. In its primary goal as a fitness tracker, the Vivosport still delivers. You will do more steps without realising it, and that nudging message to 'Move' does make a difference during the day. Once you familiarise yourself with how much data is viewable from the band as well as what is available in the app, you'll be able to appreciate that Garmin really is getting to grips with offering features that even non-sporty folk will appreciate. Sports tracking is what Garmin does best, and the ability to squeeze those features into increasingly slimmer bodies is something that should be applauded. The built-in GPS is the headline feature here, giving you the ability to track running and cycling sessions without having to piggyback off your phone. There are very few fitness trackers that offer that ability, and it's a reason you might consider paying a little more for it over the Vivosmart 3. To put it to work, a firm press on the main watch screen opens up the tracking menu and you can pick from walking, running, cycling or cardio training. All other modes like strength training do not offer GPS support. The time spent waiting for a GPS signal can vary, sometimes it can be a minute, other times it can be a couple. It's definitely not the quickest we've tried, but you won't be left waiting so long that you'd consider ditching it and opting for your phone's GPS instead. We've spent most of our time with its run-tracking abilities, but we'll update with our thoughts on cycling at a later time. For running, you have a choice of free training, a run/walk interval-style mode or a virtual pacer to run against your previous best pace. Data fields are split into two during a run and swiping up and down the display reveals standard metrics like pace, distance and heart rate. As far as doubling as a skinnier sports watch, it does the job well and while we would obviously have preferred a bigger screen to review the real-time data, you won't have to squint to review your progress. Up against the Polar Beat iPhone app, Apple Watch Series 3 and the Garmin Forerunner 935, the Vivosport delivered on the accuracy front as well, as the screenshots below show. Mapping was pretty much on the money, as were metrics such as average pace, which was just a second off the Forerunner 935, although elevation gains tended to be a little off. It'll also deliver heart rate metrics, courtesy of Garmin's own optical-based Elevate sensor. We haven't been blown away by Garmin's wrist-based heart rate sensors in the past, but things have improved with the Fenix 5 series and running watches like the Forerunner 935. We put it to the test against Polar's H10 chest strap and found that it's more of what we saw with the latest Fenix and Forerunner watches. Average and maximum heart rate readings generally registered higher on the Vivosport as it tended to take longer to drop back down to resting heart rate. As the screens above show, there are definitely more drops in heart rate with the chest strap readings from the Polar H10, while the Vivosport appeared to show less severe dips. This is something we've seen with other wrist-based monitors. So if you were hoping for absolute accuracy like a chest strap, then you're not going to get that. It works well, but it's still not perfect. There are of course other sports modes which don't require GPS, including the new strength training mode, which will allow you to count reps for a series of upper body bodyweight, free weight and machine-based workouts. It doesn't work for everything, but it's still pretty comprehensive. Rep counting is pretty accurate and was never more than one rep out, while the ability to edit sets and the weight lifted is a nice touch. Again, that small screen can make it a slightly fiddly process to do that editing. A longer display would've been beneficial here as well, simply because you can't see your rep count unless you move to the inside of your wrist. It's definitely a good addition and yet another feature that puts it out on its own in the tracker realms. Garmin has been pretty good about rolling out as many of its smartwatch features across all of its wearables. So if you have an iPhone, Android phone or Windows phone you can expect to read first and third party notifications from your Vivosport as well as answer or reject calls and control music playback. We've spoken about our lack of love for the small screen and it's a particular problem when reading notifications. If you're happy to read a message squeezed onto a slither of a screen, then great, but we imagine that's not the case for most. You can dismiss notifications, which works fine, but it's just really difficult to read them in the first place. Taking control of your music is a smart feature that is well implemented, and while pretty basic, it just works and is the feature we ended up using the most. We've been critical of Garmin's Connect companion app before, simply because it's still felt geared towards sports tracking as opposed to fitness tracking. It's currently rolling out a beta version of its new Connect app though and things are changing, represented by a UI that is far less cluttered and makes it much easier to get a snapshot of your day, whether that's steps or tracked workouts. If you want added detail or a breakdown of your runs, that's still there too, but it's no longer front and centre and we think that's actually a good thing. The new tiled look will show you data like heart rate, steps, intensity minutes, floors, stress scores and more. It's much more user-friendly and brings it more in line with what Fitbit, Misfit and others offer in their respective companion apps. Lying under that More tab are more extras than most will probably ever make use of, but crucially Garmin no longer feels like it's overwhelming users with options and features. Of course most users will have to be content with the current app for now, and will have to wait to get the pleasure of using the new-look app, but we'd definitely say things are going in the right direction. If there's one thing Garmin rarely disappoints with, it's battery performance. That's why we are a little more forgiving about some of the sacrifices made on things like screen quality. If you don't have to have that charging cable nearby at all times, that can only be a good thing. The Vivosport promises to deliver up to seven days in smartwatch mode and eight hours in GPS mode. In our time, that's pretty much on the money. If you've got every feature possible running and you're tracking a few runs a week, it's going to manage around five days. If you turn off features like 24/7 heart rate monitoring or crank down the screen brightness, then you'll get closer to those seven days. But we think most will manage to get to around the end of the week before needing to power it up again. That's roughly what the Vivosmart HR+ delivered, so while it doesn't really offer any major improvements in this department, it's still a solid performer. The Garmin Vivosport, like its predecessor, offers a great fitness tracking experience. For those that yearn for those sports tracking extras on top, it still delivers on that front too, even if nothing groundbreaking has actually been added into the mix. The decision to ditch the button and not introduce a bigger display is disappointing though and if there's a next instalment, we hope that's rectified. If you're looking for one of the most feature-packed fitness trackers out there, this is still one of the best. We just wish Garmin had made some different design choices.